The Alexander palace is a Roleplay site on avidgamers that I made. I know it is technically not an informative site, but you get the opportunity to play one of the IF, their relatives or their servants. We have an Olga (me), an Alexei, and a Marie. Historybuff262 is also on the site. Enter Tsarskoe Selo, the Tsar's Village, and enter a world of mystery, pagentry and beauty. Behind the iron gates sit two palaces, one of them the home of the Tsar Nicholas II & his family. The Alexander palace is considerably small for a palace, with only one hundred rooms. Inside, you find the majesty of the Tsar himself and his wife, Alexandra. Their five children are happy and carefree, and each of them are beautiful and special in their own way. 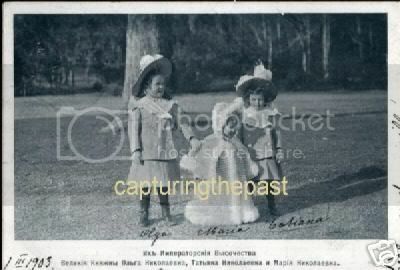 This is the home of Olga, Tatiana, Maria, Anastasia and Alexei, the children of the Tsar, as well as many other royal family members. The year is 1913, the year before WWI shattered their lives, the year where they celebrate the three hundreth anniversary of the Romanov reign. There are crowds along the roads, every person hoping to catch a glimpse of the Emperor and his family. From the outside, everyone is happy and they celebrate accordingly. However, on the inside, all is not well. Tatiana is ill with typhoid and Alexei is still recovering from an accident at Spala. Nicholas and Alexandra are preoccupied in planning their Tercentenary celebrations, making Alix ill with worry and stress. On the outside, it's the most holy family in the whole of Russia. On the inside, it's your average chaotic family. Here is your chance to replay history, maybe even make it better. Play any character involved in the Russian Imperial Family in 1913, ranging from Empress Alexandra to Grigori Efimovich. Obviously, the site is still under construction, and roleplayers of all abilities are welcome. We offer six different boards for the Alexander Palace, as well as more to come for the Standart & many other palaces including Peterhof, Livadia & the Catherine Palace. We would really like for you to join and help make this site better (I HATE the color scheme...help!). Have fun! And admins, feel free to lock this thread if it considered unacceptable. My friend was trying to keep me entertained (sometimes he can bore me to tears) and came up with this game. The first person (me) writes two things and the next person chooses which one they prefer, then another. Example: CSI: Miami or Dog the Bounty Hunter. Then the next person writes which one they prefer (ex. Dog the Bounty Hunter) and something else (Nickelback) So it looks like this: Dog the Bounty Hunter or Nickelback? Crossing Jordan or Friends (the TV show)? I've read that the collar Joy wore was made by Faberge, as well as other collars for various pets. Can anybody tell me if this is true or post a few pictures of a "Faberge Collar" ? 23 pages??? Whoa. Let's start a new one, shall we? I am looking for a larger photo of OTAA and the two dogs during their house arrest. The one I have isn't as nice as the one with OTMAA and the one dog. Please? Apparently, Tatiana owned several little rock crystal bulldogs made by Faberge. Were these actually based on Ortino, or just because she liked the breed? Since she received Ortino in 1914 during her nursing years, was it even possible to get them to Tatiana? Any information or pictures is greatly appreciated. Books about the Romanovs and Imperial Russia / "The Endless Steppe"
I was cleaning up after school one day and I look into one of the garbage cans. In it I find several hardcover books, among them this. It is by Esther somebody and is about a Polish 10-year-old being taken from her home to someplace in Siberia. It is based on the author's own experience. Could anybody tell me more about this book? It's in pretty good condition. "One has to struggle much because the return for good is evil, and evil reigns." But we all know Olga's famous words, "It is not evil which conquers evil, but only love..."
The two girls seemed to have opposing ideas about evil. What do you think happened? I have a friend who is doing a Projct on Mashka and will be presenting it in front of her school. However, she needs some quotes in order to complete the report. She can't have anecdotes, just something she said or wrote. Olga Nicholaievna / Olga with any pets? Are there any photos of Olga with dogs or cats? I just haven't seen very many... The only thing I've seen is a photo of her cat Vaska and a photo of her and her sister with an almost stuffed-looking cat. Any photograph of Olga with a puppy will be celebrated by a ten-woof salute . Anastasia Nicholaievna / Pictures of Anastasia with Jemmy, Shibzik, etc. I can't seem to find many pictures of Anastasia (or Olga, for that matter) with her dogs. As you can tell, I love dogs and I think it would be easier if we had all of the photographs of Anastasia and her dogs all in one topic, just to save us the stress of using the search engine all the time .